The HighRPM highlights of the 2010 Supercheap Auto Powercruise in Darwin, Australia. Presented by Tamika Barnett & Auki Henry. The Australian Powercruise is one of the most publicly recognised events on the local car scene and sees generous turnouts of both enthusiasts and general public as it incorporates many different genre's of motorsports and elements of auto shows. This year the national organisers were kind enough to let some of the HighRPM media team in to cover the event alongside their official Powercruise media personnel. Filmed at Hidden Valley Raceway. Special thanks to Powercruise, Film Cartel and Zerolizard for their assistance. 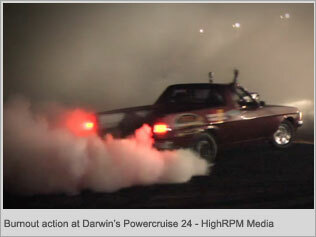 Powercruise 24, Darwin 2010 | HighRPM highlights from High RPM on Vimeo.